It is great for coming through rocks and other underwater obstructions. Its shape allows them to stay on top of cracks and narrow gaps in the rock, and the higher density of their tungsten composition makes it much more compact than comparable lead weight. Tungsten is also much harder than lead, which means you can better detect anything your weight comes into contact with available in multiple sizes for a great price. 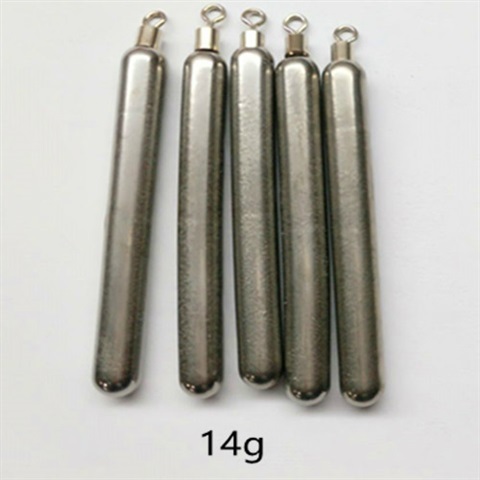 Tungsten Alloy Skinny Dropshot Weight Tungsten alloy skinny dropshot weight is shaped like a slender rod. It is perfect for use in any situation where bait or soft plastics are fished suspended over the bottom or submerged cover. Skinny dropshot weight is designed to attach quickly to the tag end of the hook knot. It is our leading product, which separate from the line with slightly pressure, then skinny dropshot weight would take to break the knot. Skinny dropshot weight offered by us is high quality product. Guangxi Chentian Metal Product Co.,Ltd.could not only offer skinny dropshot weight as per international standard, but also could design skinny dropshot weight according to customer's requirement. Sometimes, to make skinny dropshot weight, we need to design and make mould first, we could usually offer weight such as 1/16oz, 1/8oz, 1/6oz, 3/4oz, 1/4 oz, 1/2oz, 1oz, 1.25oz, 1.5oz, 2oz. Besides, Guangxi Chentian Metal Product Co.,Ltd. could design and offer package as per client's requirement, usuualy, plastic box will be popular for packing this kind of products.